Fiber optic connectors act as the backbone of many computer and telecommunication networks by carrying data at high speeds, allowing for a variety of applications such as mass communication, facilitating video streaming, and more. Because fiber optic connectors transfer information using beams of light, keeping them clean is important to maintaining their effectiveness. Cleaning fiber optic connectors is very easy and will help ensure that they perform at an optimal level. As information technology needs grow, businesses and industries are installing more and more fiber optic cable and networks. In 2012, more than 19 million miles of fiber optic cable was installed in the U.S., the most since 2000. Growing demand for high speed Internet for videos and quick connections for the financial services industry, plus the needs of the telecommunications industry, are all fueling a boom for fiber optics. 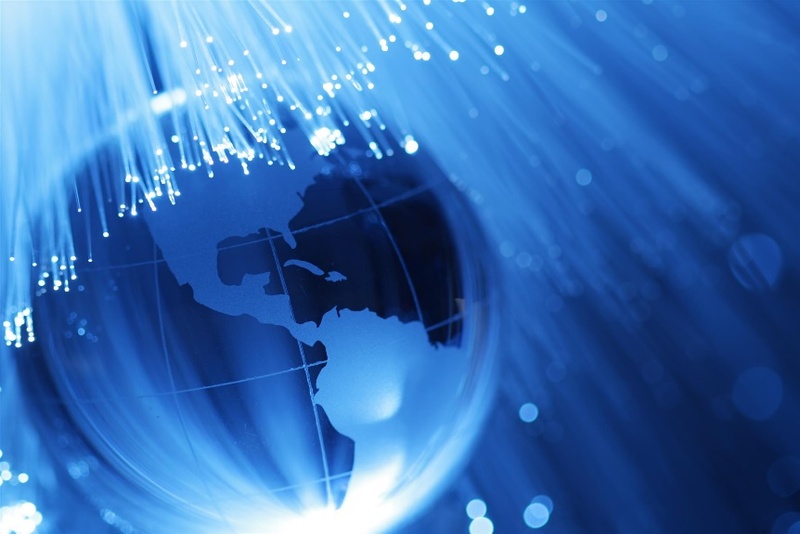 Fiber optic communications rely on very small fibers to carry beams of light. Most fiber optic cores are between 9 µm and 62.5 µm in diameter, much thinner than the typical strand of human hair, which is about 90 µm in diameter. Because of their small diameter, even the tiniest bit of dust, dirt, oil, or other contaminates can degrade an optical signal. Fiber optic cables contain many fibers and are designed with the knowledge that some fibers will be occluded by dirt or other contaminants at some point. However, most can only afford so much blockage before they become ineffective, resulting in diminished service or even down time for the networks they serve. Slow connections and downtime can be costly for businesses relying on their fiber optic networks. That’s why keeping connectors clean is so important. In addition to just eyeballing your fiber optic cable connectors to ensure they are clean, there are also some scopes on the market that let you take a closer look at your connectors to ensure they are in good shape. Desktop and handheld fiberscopes can help fiber optic cable owners ensure they’re getting the whole picture with regard to their cable. You’ll want to make sure your fiberscope can provide 200x magnification to get the best view of your fiber optic connection. Dust and dirt. Tiny particles of dust and dirt can easily find their way onto exposed fiber optic connectors, causing diminished effectiveness. This is likely the most common contaminant that fiber optic connections are exposed to. Metallic particles. Often the bodies and fiber housings of the fiber optic connectors will wear and small particles will block a fiber, causing loss. Charged connectors actually attract metal particles. Exposure to metal particles can result in damage to the fiber end if the connector is improperly cleaned. Oils. When fiber optic connectors are handled, oil from human skin can come in contact with fiber ends, resulting in contamination. Oils from other devices used near the fiber optic connector may also cause contamination. It’s generally a good rule of thumb to inspect connectors for contamination or damage whenever they’re disconnected or reconnected. Often, you will be able to spot major contaminations, allowing you to clean the connector to restore effectiveness. There are a variety of methods to clean fiber optic cables, some more effective than others. Understanding the methods can help you make the right choice with regard to your fiber optic connection. IPA alcohol is often used to clean fiber optic connectors, but it is not always the best solution for cleaning them. It can leave a residue behind – even 99 percent, optical grade IPA alcohol. It’s also quite slow to dry and can result in damage to the fiber if the connector is put back into use before it dries. Optical cleaning fluids specifically designed for cleaning fiber optic connectors are a better choice. These nonflammable, nonhazardous chemicals will help clean fiber optic connectors without risk of damage. Two well-regarded cleaners for fiber optic cleaning are FCC2 cleaning fluid and FPF1. FCC2 is a fast-drying cleaner created to be used with cleaning sticks designed to thoroughly clean fiber optic connectors. FPF 1 is slower drying, but works well with fiber wipes that are used to clean fiber that has been stripped to prepare for adding connectors to fiber ends. These two products are safe and, unlike IPA alcohol, can even be taken on air flights with little hassle from the TSA as they are nonhazardous and nonflammable. Ultrasonic cleaners are another excellent way to clean fiber optic connections. Because they use no liquid chemicals, you don’t have to wait for them to dry before re-use, and damage because of contact or chemical abrasiveness is not a worry. Once a fiber optic connector is cleaned, it’s best to reconnect it immediately or cover it with a cap to ensure it doesn’t get dirty again. Owners of fiber optic networks should research their options for fiber optic connection cleaning and pick the method that best suits their business. By regularly inspecting and properly cleaning fiber optic connectors, their users can ensure that their networks utilize the full speed and potential of fiber optic communications. Photos: National Positions stock photos.